For me, Warrior pose is a true symbol of courage. This is the pose that helped me build back my strength after my second car accident. I will never forget my many days, out on my deck doing yoga and celebrating my warrior. At first, I could only hold it for a few breaths and couldn’t lift my arms because of the pain, but eventually my warrior - she grew stronger!!! Greg, my student pictured below is a husband, father and amazing young man. He is preparing to begin his next journey in the Air Force. Greg is a kind, compassionate, strong, courageous, and humble man. A true living example of a strong warrior! Today, celebrate your strong warrior. BE COURAGEOUS!!!! 1. 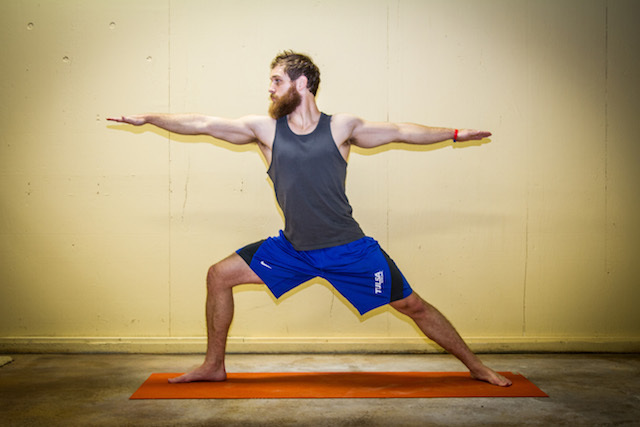 Stand in Mountain Pose, then step your feet 3 ½ to 4 feet apart. Shorten the distance if you want less of a challenge. Raise your arms parallel to the ground and reach them out actively to the sides, shoulder blades wide, palms down. 2. Turn your right foot slightly to the right and your left foot 90 degrees. Align the left heel with the right heel - draw an invisible line from heel to heel. 3. Make sure the forward knee is aligned directly over the ankle. Back leg is strong and active and knee is not bent. 4. Hold for 5 - 10 breaths then repeat. Move then to the opposite side. Check with medical doctor if you have neck, shoulder or spine injury or are pregnant.